I’m excited to share this cookbook review with you today! 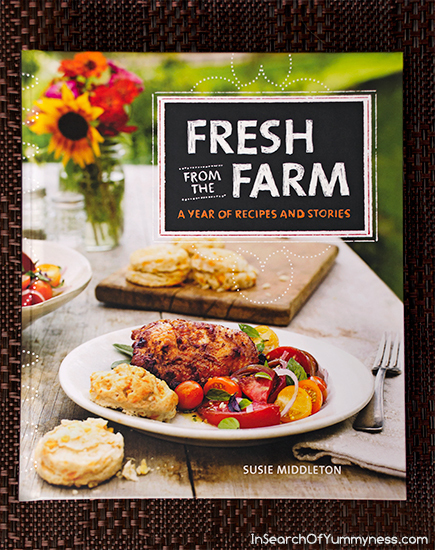 Fresh from the Farm: A Year of Recipes and Stories is the third book from one of my favourite cookbook authors, Susie Middleton – the former editor in chief of Fine Cooking magazine. I’m a big fan of Susie’s work. I own both of her previous books Fast, Fresh & Green and The Fresh & Green Table , I frequently visit her blog, and she even let me republish on of her recipes on this blog. So it’s not terribly surprising that I enjoyed reading and cooking from this new publication. This cookbook not only boasts a collection of 125 simple recipes, but it also chronicles one year of Susie’s life on her farm. Her detailed, personal, and often humorous, story is woven in between beautiful photos and delicious recipes. There are some practical gardening tips in there too. I tested two recipes specifically for the sake of this review. The first one is Yogurt, Summer Berry & Homemade Maple Granola Parfait. On a scale of super easy to tricky, this is definitely the former. All you have to do is make the granola, let it cool, toast some nuts and then assemble with other ingredients. The result is a parfait that is easy enough to throw together for breakfast, but indulgent enough to have for dessert. The second recipe that I tried making was Roasted Butternut Squash Risotto with Thyme, Parmigiano & Toasted Pine Nuts. This falls under the tricky category, at least for me. I made a mistake right at the beginning, which was my own darn fault. I saw a photo of a butternut squash cut in half on a roasting pan, so I immediately assumed that I should roast it that way for the recipe. I’m sure most readers would be smart enough to read the actual instructions and roast diced pieces of squash instead! The photo was under the story narrative, and it’s fairly obvious that it’s not part of the actual recipe. I’m just notorious for not reading the whole recipe before I begin cooking. The other mistake I made was that I left my chicken stock heating too long (and I probably had the heat too high). By the time I actually started making the risotto the stock had reduced too much. Again, those are human errors and the resulting dish was very good. 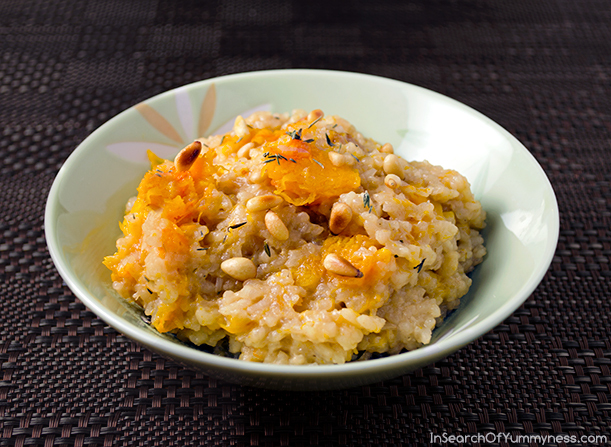 I loved how the sweetness of the squash paired with the creamy rice and crunchy pine nuts. My family enjoyed this too, we barely had any leftovers! What I love the most about these recipes is that they are comfort foods, but they showcase seasonal produce and are fairly good for you too. Susie’s previous cookbooks featured this kind of food too, but those books focused more on cooking techniques while this one focuses more on the ingredients. If you’re interested in purchasing this book, you can order it online from Amazon.com or Amazon.ca . You can also find it at most major bookstores and some independent book stores. For more information about this book visit Susie’s website. There is a sneak peak video there too. Fresh from the Farm is published by The Taunton Press. This is not a sponsored post, however the book was sent for my consideration. Thanks Cindy! I wasn’t totally thrilled with that photo, so I appreciate the compliment! I highly recommend this book and Fast, Fresh and Green. They are both lovely!